The three deep drawers provide an abundance of storage space. Behind the two doors, you will find adjustable shelves and storage space for things that you prefer to be out of sight. The center storage area is great for up to 12 bottles of wine, or if you prefer, remove the wine storage cubes to reveal an adjustable shelf. 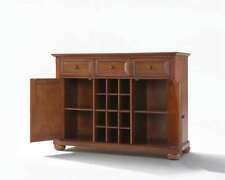 Constructed of solid hardwood and wood veneers, this Buffet Server / Sideboard Cabinet is designed for longevity. The three deep drawers provide an abundance of storage space. 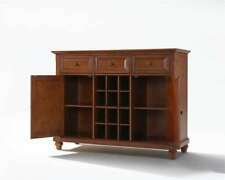 Behind the two doors, you will find adjustable shelves and storage space for things that you prefer to be out of sight. Simplistic style lends way to ample storage of life’s most important necessities whether it be dining related or otherwise. Bar Furniture (529). So why buy from us?. And our friendly and knowledgeable phone staff is available 24-7!